I love French books for children. So many times I’ve read what seems to be a typical story involving balloons, elephants and magic that suddenly meet up with a friendly alligator. Things seem to progress smoothly approaching a Hollywood end, until someone inevitably ends up in the other someone’s tummy. Lights off. Time for bed. You dream about that, girls. Nighty night! During our evening goûter, homework, play outside, yell, bath, no bed, yes bed routine, Otto read a bit of his home reading to me. I listened mostly. Thinking about cows and farm and yummy beef and being more farmer less mom, I nodded at the right moments. After, I asked him to translate. He said the title, “News of a cat assassin.” “Assassin?” I woke up, “Assassin? Did you read that correctly?” He did. I was intrigued. 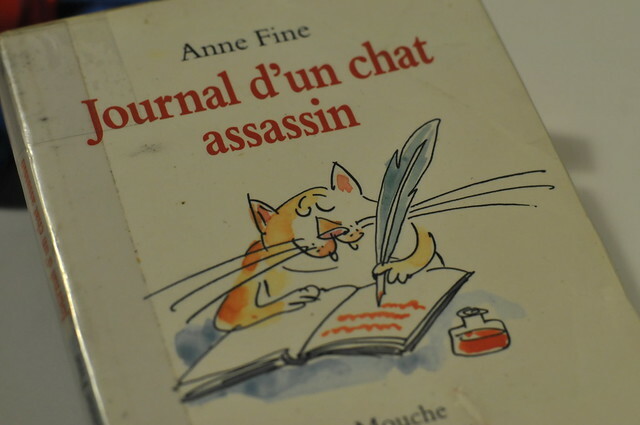 A cat kills mice and birds and the rest ( … really, I think I need to use this book to improve my very not so good French ). Then he, the cat, blogs about it. Crazy chat. I suppose I should follow up with a book report, but for now, I’ll work on a new musical Feline Bourne Trilogy with tunes inspired by Leo Sayer. One of Charlotte and Duncan’s favorite books is Leon l’etron (I hope I spelled that right) about a turd of poop that sleeps in a diaper and flushes himself down the toilet during a bout of depression. The French definitely have a different view of children’s stories. I brought back that book from my 2008 France trip and they still love it. OOOoo. I’ve not seen that one. Otto and Z would love that!